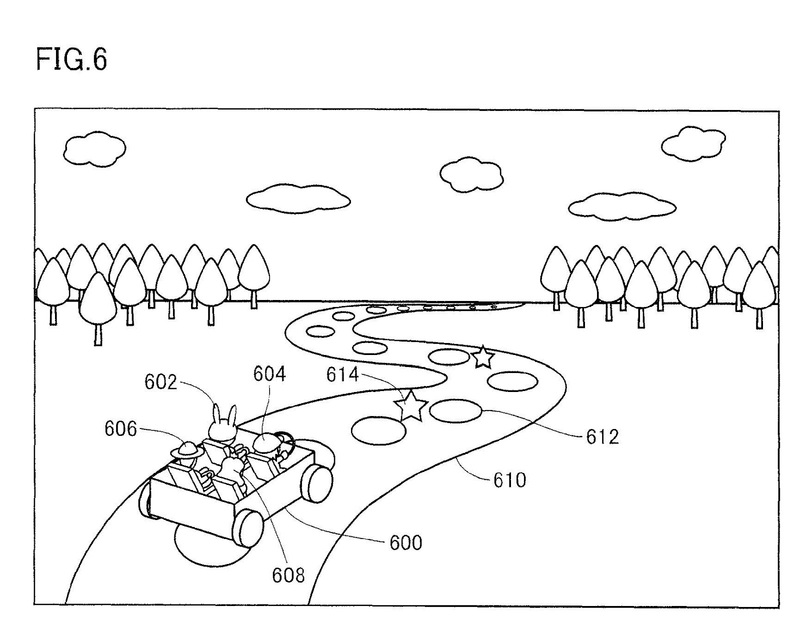 Issued August 9, 2016, to Nintendo Co., Ltd.
U.S. Patent No. 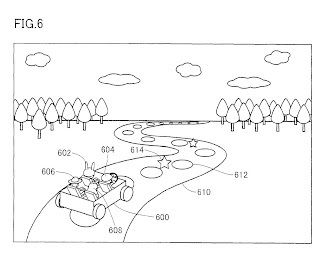 9,409,085 (the ‘085 Patent) describes a method to have an interactive background for a tennis video game. This gameplay mechanic is used in Mario Tennis Open’s Super Mario Tennis mode. In the mode, a player using a game character, like Mario, hits a tennis ball against a practice wall. Super Mario levels are superimposed onto the practice wall. The levels scroll like a Super Mario level and even feature classic Mario enemies like Bowser or Gumbas. Players can interact with the level by hitting the ball against the practice wall. Hitting different areas of the level will cause different effects. If the ball hits a Gumba, then the Gumba is squashed, and the player earns points. 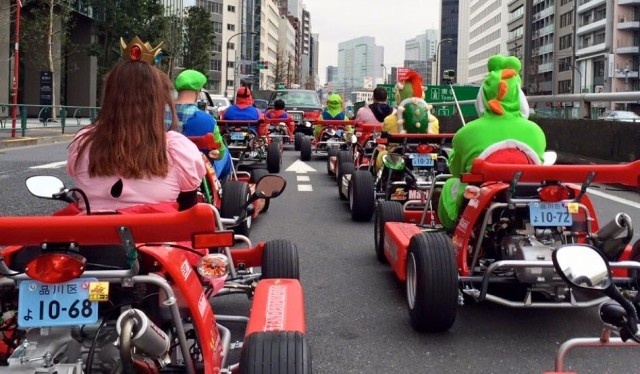 Hitting a box may cause a powerup to appear giving the players special powers. The player completes the mode like every other Mario game, defeating Bowser and rescuing Peach. 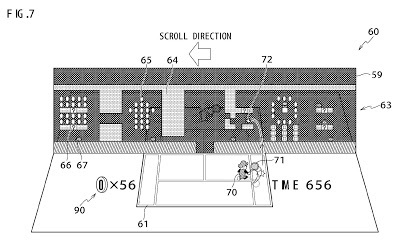 An exemplary embodiment sets the game background image with surface objects (bricks, coins, item closed box baffles, monsters, and the like) arranged therein in the middle of the tennis court within a virtual space for executing a tennis game containing the motion of hitting the tennis ball according to an operation by the player, and scrolls the surface objects arranged in the game background image. Then, there is provided an effect corresponding to the type of the surface object (benefit object, the hit map switching object, scoring object, or the like) arranged in a position of the game background image, where the tennis ball shot in response to a player-operation has reached. 1. A game system including a display device and a player operation inputting device, the game system configured to perform video game processing to execute and display a virtual ball game which takes place within a virtual space, comprising: one or more processors configured to interact with a user providing inputs via an operation inputting device and perform game processing to execute and display the virtual ball game which takes place within a virtual space, said one or more processors configured to perform functions and operate as: virtual ball movement processor which performs a game process wherein a virtual ball is moved within the virtual space in response to a hitting operation performed by a player using the operation inputting device; a virtual object setter configured to set a virtual three-dimensional object at a predetermined position in the virtual space, the virtual three-dimensional object having a surface where a virtual ball hit during the game process can reach; a virtual object surface image arranger configured to make one or more object surface images appear upon the surface of the virtual three-dimensional object; a virtual object surface image movement processor configured to move, within the surface of the virtual three-dimensional object, the one or more object surface images made to appear upon the surface of the virtual three-dimensional object; an effect processor configured to provide a predetermined effect in the game process, based on a condition that at least one of the object surface images made to appear upon the surface of the virtual three-dimensional object are present at a contact position of the virtual ball with a point on the surface of the virtual three-dimensional object, when a hit virtual ball reaches the surface of the virtual three-dimensional object; and a display processor configured to display the virtual space and the virtual ball game on the display device.